Last call for your videos! Submit your Entry Form now! The Group on Earth Observations (GEO) is inviting submission of short videos for its upcoming GEO-XII Plenary (11 and 12 November 2015) and Ministerial Summit (13 November 2015) that will take place in Mexico City (more details are available at www.earthobservations.org). GEO is seeking short videos highlighting how GEO, and Earth observations in general, are helping to address global and regional problems. We welcome videos of any genre, of no more than 3 minutes in length, relating to Earth observations (i.e., people using GEO resources and Earth observations for research, policy and planning purposes, and other uses). You do not need to be a professional to submit a video! Submit Your Entry Form Now! The purpose of the competition is to gather short videos that highlight the impacts of GEO, with a particular focus on the theme of GEO’s second decade – Advocate, Engage, Deliver. All videos should include clear references to the Group on Earth Observations and/or the Global Earth Observation System of Systems (GEOSS). Registered participants in the GEO-XII Plenary and Ministerial Summit in Mexico City will be able to vote on as many as six (6) videos to determine which (up to three) will be shown during the Ministerial meeting on 13 November 2015. Videos must be 3 min or less in length (see details below). The video must be your own original creation and must not infringe on any third party rights. The video should provide a clear example of how Earth observations have a positive impact on peoples’ everyday lives. GEO will establish a voting system for registered delegates of the Plenary. Voting will open 19 October 2015 and close 12:00 pm on 12 November 2015. Results will be announced on the GEO website and social media outlets. The three (3) winning videos will be played during the Ministerial. 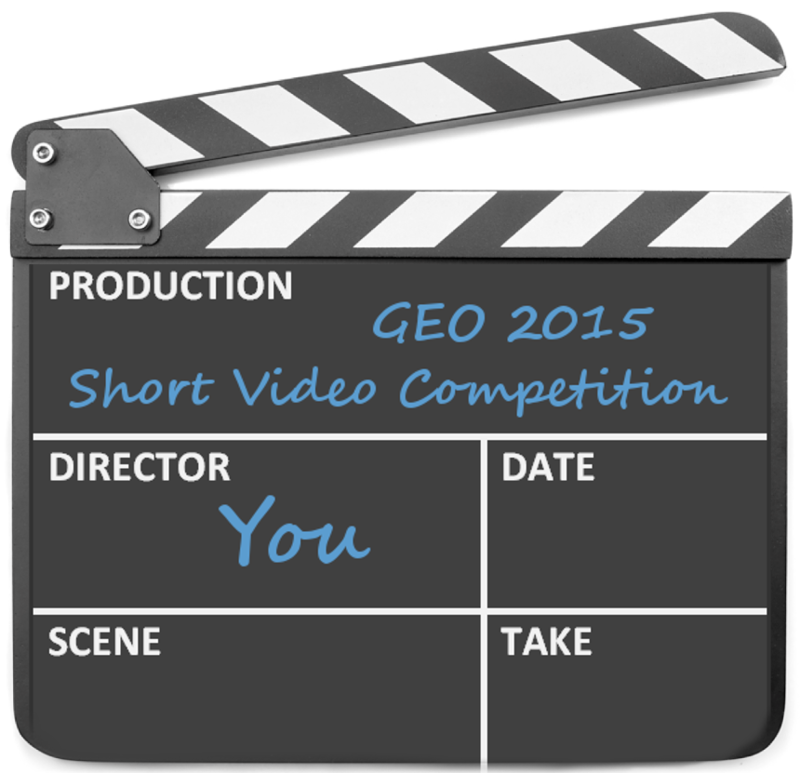 Submitted videos will also be played during the GEO Exhibition. A download link (Dropbox, Google Drive, or other cloud storage or FTP link) to each video must be provided to secretariat@geosec.org by 9 October 2015. Entrants must complete our designated Entry Form, with all fields accurately completed in full. An individual entrant may submit up to three (3) separate entries in total. Subsequent entries will not be deemed valid. The Competition period closes 9 October 2015. Results will be announced by 13 November 2015. The decision is final and binding. The Competition is open to all individuals and groups, regardless of age or location. Employees of the GEO Secretariat are prohibited from Competition entry. Entrants under 18 years of age may participate with the permission of their parents or legal guardians. If the video of an entrant under 18 years of age is chosen, and written parental or guardian permission cannot be provided, GEO has the right to reject the entry. Entrants are required to obtain permission from all persons appearing in a video. If an entrant is chosen winner, and such written permission cannot be provided, GEO has the right to reject the entry. Use of copyrighted materials is prohibited, unless the entrant has written permission to use such materials. If written permission cannot be provided, GEO has the right to reject the entry. Entrants of all videos selected as winner will be notified via e-mail. The entrant retains the rights to his/her videos; however, by entering the video competition, he/she grants GEO a non-exclusive license to display, distribute, reproduce and create derivative works of the entries and texts, in whole or in part, in any media now existing (such as publications, websites and social media) or subsequently developed, for any educational, promotional, publicity, exhibition, archival, scholarly and all other standard purposes of GEO. Due credit will be given to the entrant each time his/her video is used, wherever feasible. Videos and text will not be used for commercial purposes. Previously published material for which non-exclusive rights were granted may be entered, as long as you still warrant full usage rights. However, upon submission you must disclose when and where the video previously appeared. Entrants must not infringe on the rights of any other videographer, person or organization, and cannot submit footage that involves the willful harassment of wildlife or damage to the environment by the videographer. GEO will not be responsible or liable for: a) any problem, loss or damage due to delay and/or failure in receiving and sending the entry as a result of any network, communication or system interruption or error; b) any error, interruption, deletion, defect, delay in operation or transmission, site failure or unauthorised access to entries, as a result of use of the designated email channel and/or website; and/or c) any problem, damage or loss of whatever nature to any entrant, or their authorised representatives, resulting from their participation in the Competition. GEO reserves the right to cancel, modify, suspend or delay the Competition in the event of unforeseen circumstances beyond its reasonable control. GEO reserves the right to change, amend, delete or add to these Competition terms and conditions without prior notice at any time, and the entrants shall be bound to such changes.